"Like" token, awarded by Elitre. "Love" token, awarded by waldyrious. "Party Time" token, awarded by RandomDSdevel. "Love" token, awarded by TheDJ. "Love" token, awarded by Florian. "Like" token, awarded by Jdforrester-WMF. 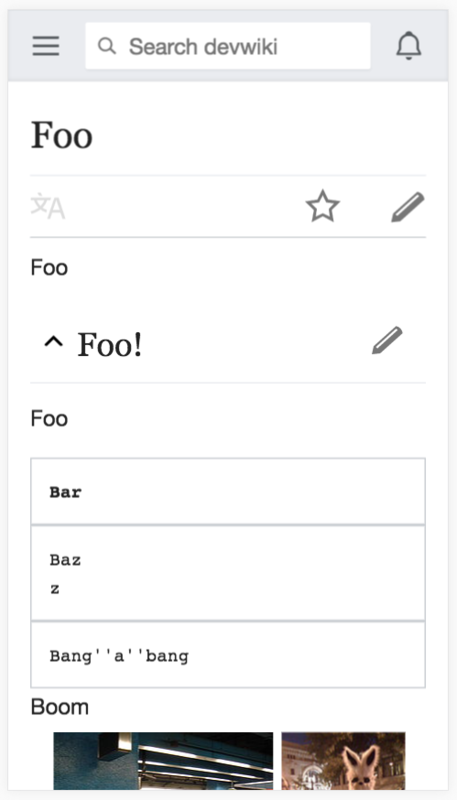 With minor work and the removal of Special:MobileEditor this seems possible. Decrease size of text area so for logged in users without an anon warning box the buttons below it are visible on a standard mobile screen. cancelLink, mw-editButtons-pipe-separator and editHelp should be hidden in mobile view - they look cramped. T164892: Unexpected general module "mobile.messageBox" and "mobile.mainMenu" in styles queue. • Jdlrobson removed Sumit as the assignee of this task. Florian added subscribers: Nnemo, MZMcBride. Hi Sumit I'm abandoning this in case someone else wants to work on it (that can obviously be you). Luckily this change will be preserved in Gerrit for whoever wants to take another go at it! Thank you for trying! heading-holder has 20px padding-top, to give space for the in-other-languages button that's not there. Easy fix? Padding on the sides of the input box could probably be slimmed-down to give marginally more space (especially when there's so little of it). The OOUI-ification makes the checkboxes much more accessible in touch environments, but the padding's too big on the checkboxes and too small on the buttons. 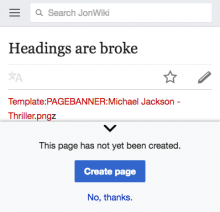 You can't edit the whole page (but you can create it). 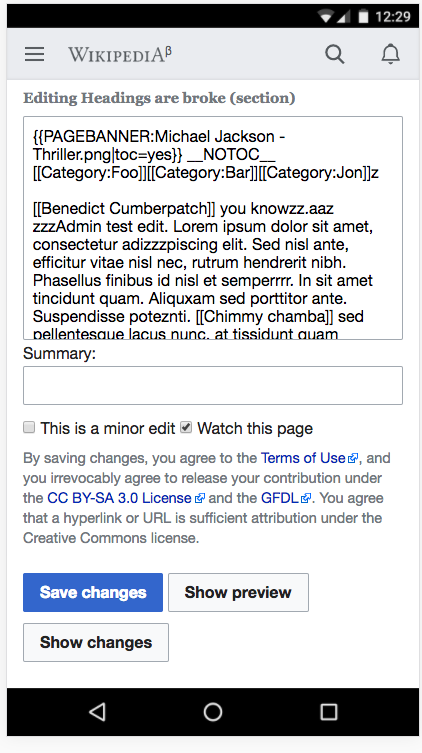 You can't edit section 0 unless you URL-hack it. Collectively, this means that on pages where there's no sections yet, you can't do anything. The save buttons are not in view on open, but they're also never going to be as soon as the keyboard opens, so I'm not too worried. Overall I feel this is quite close. 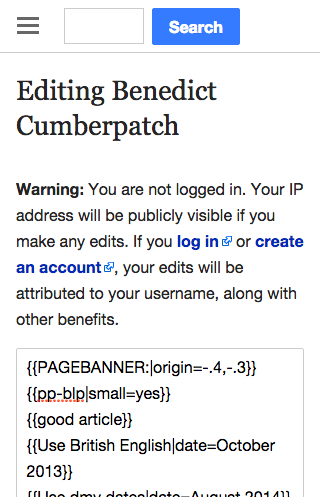 Remember this is not just non-JS editing. Slow connections may hit this page accidentally so I suggest that we give them a good experience too. Please do worry!! :) We've found buttons hidden below the fold to be less discoverable. We hit this issue with Special:MobileOptions - saves there halved when we accidentally pushed it below the fold. Most mobile interfaces I see surface the save buttons at the top of the screen on mobile and I'd suggest we'd be wise to do that - imo that's the only blocker here and there's plenty of space under the header to move them to be consistent with other products/our own! Not sure what you mean by that? The edit icon at the top of the mobile interface defaults to lead section. There is no full page editing without VisualEditor. Red links are not a problem. We do not suppress them on the mobile site and you can edit. Only apps suppress them. Sure, though of course Legal would need to sign that off. That edit icon is easily revealed. In the existing view, we have nothing to link to hence why it's there. It can be displayed as part of wrapping up the work here. After T111088 is applied it seems the main issues relate to use of space - seems easy enough to recover the space between heading and text area, shrink license size (I don't see why this needs legal sign off as they already signed off on the license text size in the editor overlay). 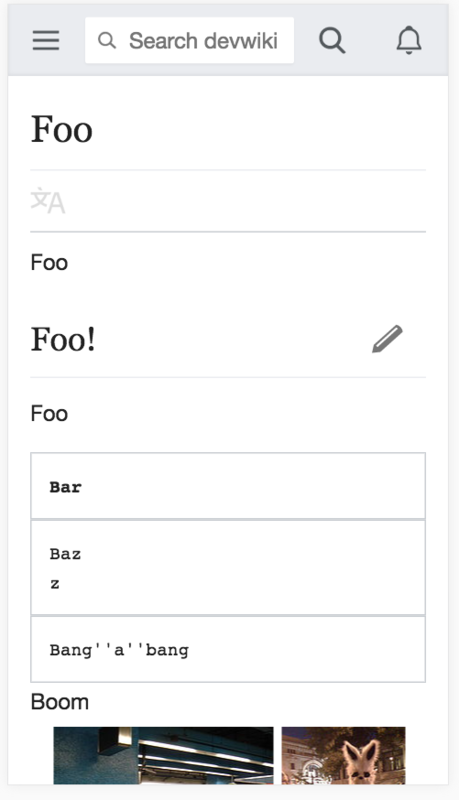 Also I wonder if the heading "Editing Foo (section)" really need to be heading font-size. This doesn't seem like much work, if we wanted to spend a day focusing on this I think we could resolve these problems promptly. Cool. Could we move it to the same level as the heading to save those ~ 30px of vertical height, or would that be difficult for other reasons? 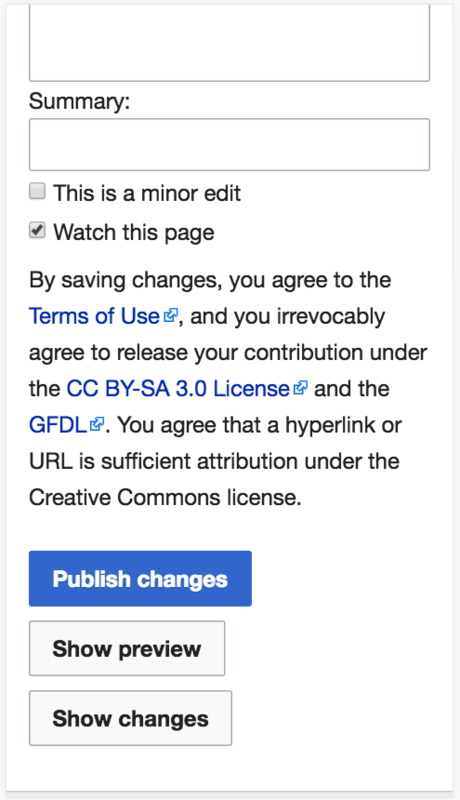 After T111088 is applied it seems the main issues relate to use of space - seems easy enough to recover the space between heading and text area, shrink license size (I don't see why this needs legal sign off as they already signed off on the license text size in the editor overlay). 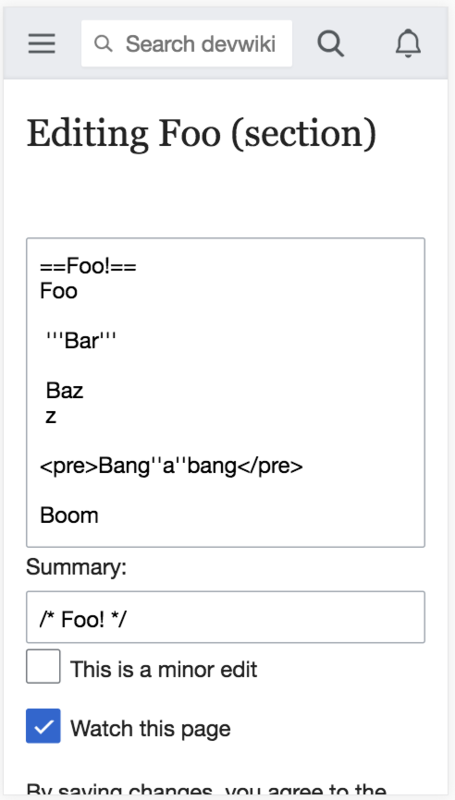 Also I wonder if the heading "Editing Foo (section)" really need to be heading font-size. Yeah, if we could shrink it a fair bit that'd also save users vertical space, which is the main premium. This doesn't seem like much work, if we wanted to spend a day focusing on this I think we could resolve these problems promptly. Nice. I'd be very happy to help. 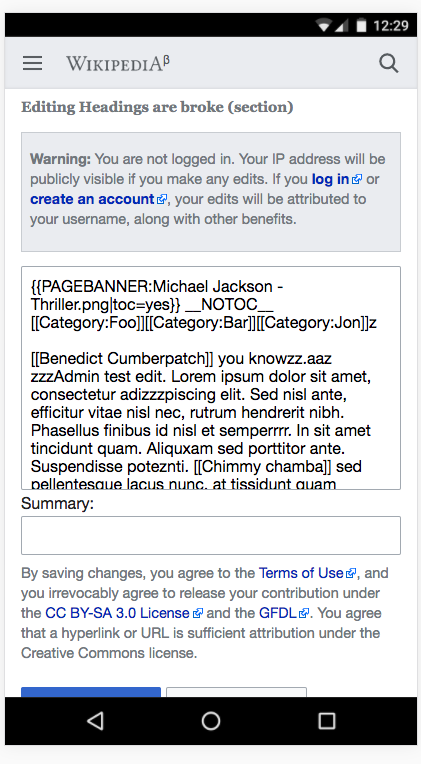 We may want to consider hiding the minor edit and watch this page boxes. 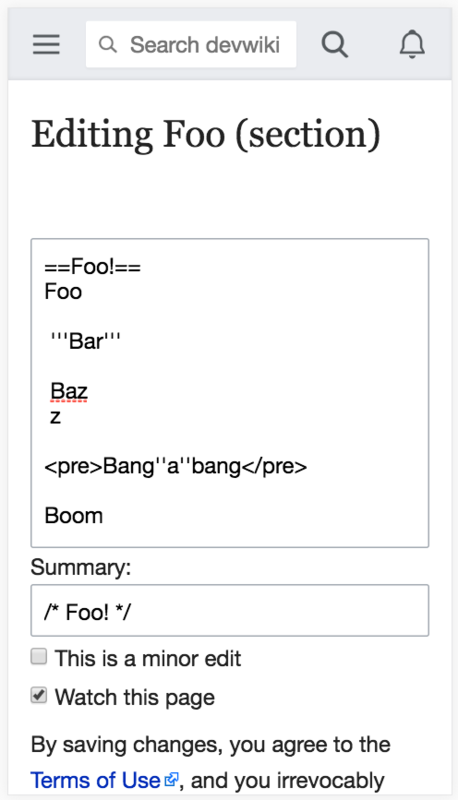 With OOjs UI the buttons get pushed below the fold and I don't think they are vital to the editing experience. I would hazard a guess that a small % of our editors actually use those boxes on desktop and in the current mobile editor we don't surface them. • Jdlrobson added subscribers: dr0ptp4kt, • Tfinc, • wikibugs-l-list and 3 others. Looks good; merged your patches (except for the hygiene one which has a blip). If you're logged out, the mobile menu has no log-in option in no-JS mode. However, if you try to edit using the no-JS fallback editor, you're prompted to login, and following the link successfully works. Is it missing from the menu for performance reasons, reducing the load for non-JS users? 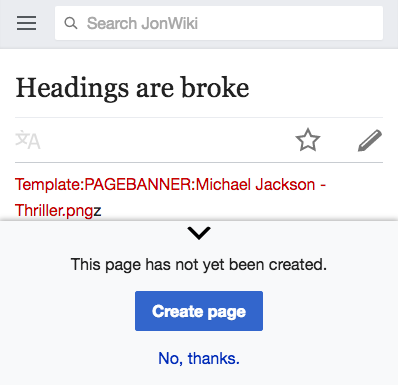 Isn't editpage-copywarn a MediaWiki message provided by the wiki? Any updates on this or any help needed? Patch is -2 with comments "Needs announcing, decision on release process." • Jdlrobson removed a parent task: T71366: [EPIC] Extract Minerva skin from MobileFrontend to its own repository. EDIT: I have now filed it to reflect that we had already had some conversation around this. Where can we follow the analysis? 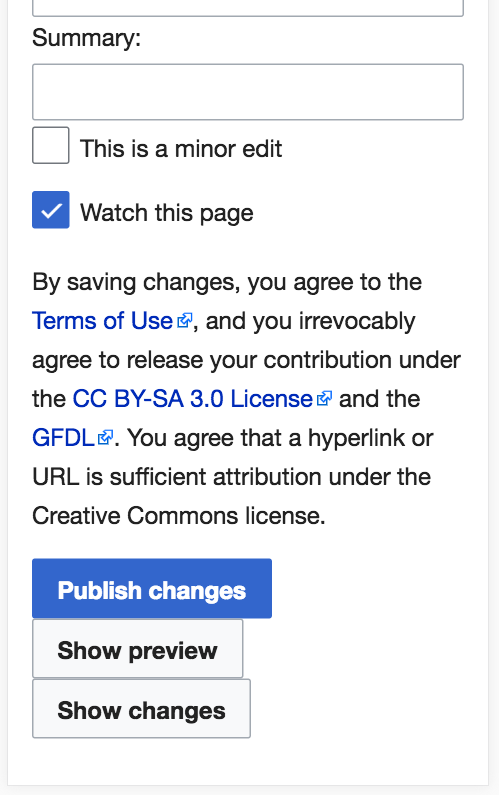 This is a huge landmark for Wikipedia mobile and I'd be interested in how this is reacted to by people with phones like Opera Mini and UC browser who previously couldn't edit. Is this something New-Readers is tracking @atgo ? Thanks for the ping @Jdlrobson . Not something we've been tracking, but glad to see it's happening! I'd love to be in the loop for any analysis that happens, though this is outside the scope of New Readers.